Cinematically speaking, the words birds and Bay Area once automatically conjured Hitchcock images of Tippi Hedren fighting off a flurry of claws and beaks. But in recent years, documentary filmmaker Judy Irving’s personal, journalistically persistent films have flipped the script of Hitch’s dystopian vision of people besieged by birds, presenting strikingly real (as opposed to surreal) images in the process of telling true stories abut the struggles and resilience of birds in the modern world—more specifically, San Francisco and its surrounding environment. 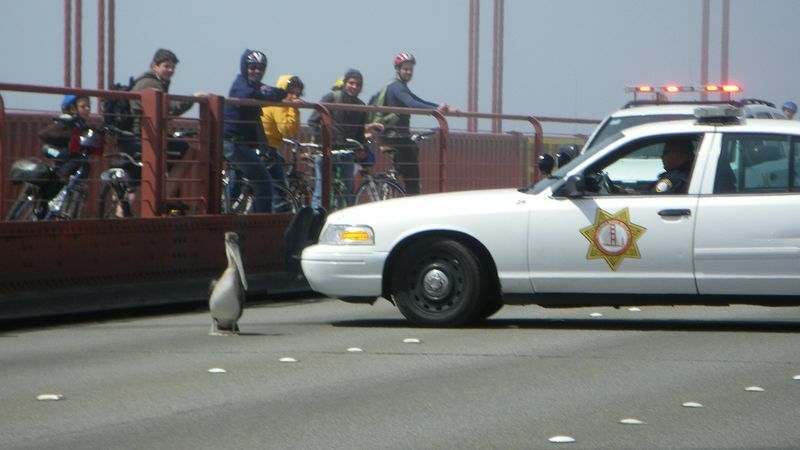 EatDrinkFilms: When the scene that opens Pelican Dreams took place—the pelican on the Golden Gate Bridge—were you already working on the movie? Judy Irving: That incident provided the opening hook that I’d been waiting for for years. I’d shot a few rolls on pelicans before The Wild Parrots of Telegraph Hill took over my life. After parrots, I decided it was time to start work on the movie I’d always wanted to make about pelicans. I didn’t want it to be a science documentary or a standard educational film. I wanted to take a storytelling approach—make it more personal or poetic. But I had no idea what that meant or how I would find my structure. That bird stopping traffic gave me my beginning. EDF: Much of the film deals with whether the injured birds will ever fly again. Things could have turned out much differently. JI: When you launch into a documentary, you have no control over how the stories are going to play out. You just have to follow them and hope that the stories will unfold in a way that is satisfying cinematically. It does make you nervous as a filmmaker. EDF: Early in the film you say, “When I was a kid I used to have flying dreams. I know what this feels like.” Do you still have flying dreams? JI: No. I don’t know whether it’s because I’m an adult, and you have those when you’re a child and are closer to some primal consciousness that includes us all or something. But I did have one flying dream during the production of the movie, and I think it happened because I’d been focused so much on trying to capture pelicans in flight that it went into my subconscious. When I had the dreams as a kid, I was soaring above the trees and above the houses. I don’t remember having to flap, which is like a pelican soaring without flapping. There was also something in the dreams about self-confidence. If I lost self-confidence, I lost altitude. If I maintained confidence I could soar forever. EDF: You have footage of young pelicans flying for the first time and you ask, “What must it feel like?” Did you have to spend long hours to catch those moments? JI: I staked out several nests where I knew that the birds had not flown yet. I just stood next to the camera and waited and watched. It was nerve-wracking worrying that I’d miss the moment. I was still shooting 16mm film at the time. For slow-motion, I had a wind-up Bolex, which records just eight seconds of real time with each mechanical wind. I had to be very careful about when I started to miss each shot. If I started too early the wind would die and I’d miss the fledge. I missed some, but I caught enough to edit with. Fortunately, I don’t have to deal with that anymore. EDF: Because you’re using video? JI: Yeah. I’m shooting HD now. You can turn on the camera and just roll forever. EDF: The foghorns lend a mournful, haunting tone to some of the footage, as do the wind chimes at the Nicholsons’ home. And then there’s Bruce Kaphan’s score. There were times that it reminded me of the soundtrack that Ry Cooder did for Paris, Texas. How did you find Bruce? JI: Bruce is a local composer and musician who lives in Niles Canyon, which is actually where the movies were born. He plays in various bands and also has a recording studio. He liked The Wild Parrots of Telegraph Hill and sent me a CD he’d made, Slider . One of the tracks was called “Arc of Flight.” I listened to it, and it worked. The title theme for Pelican Dreams is a slightly revised version of that track. He composed for the film as I was editing. it’s been a great collaboration. EDF: Does he play other instruments besides pedal steel? JI: Yes. He plays all the instruments on the soundtrack: Nylon string guitar, Dobro, dulcimer, keyboards, lap steel, percussion. Everything. EDF: When you’re making the film are you consciously looking for sounds to overscore the movie? Or does it happen organically? JI: I’m always trying to shape the mood of a scene by choosing sound effects, ambiences, music, and voices that I think will work. At Dani and Bill Nicholson’s yard they have those wind chimes, which are constantly making slightly melancholy sounds. 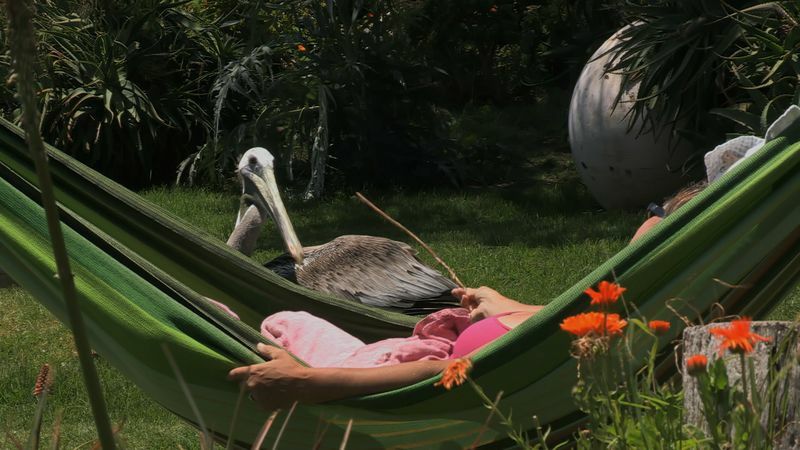 This is the yard that Morro hangs out in—the pelican with the injured wing. So I tried to make their wind chimes a metaphorical sound indicator of that location. The film intercuts among a number of locations and comes back to Morro’s yard several times. It was nice to have that sound signature. it was the sound equivalent of a location title. As for the foghorns, I love foghorns—how mournful they sound. Or poignant. They’re not necessarily sad. One day years ago I was standing in the Marin headlands looking at some offshore rocks, watching for pelicans. The fog was thick and all of a sudden a pelican appeared from out of the fog. He soared silently toward me and then disappeared back into the fog. It was a very strong image that spoke of the mystery that these birds represent to me. So one task I set for myself right at the start was to film pelicans appearing out of and disappearing back into the fog. I managed to get some shots. But it was really difficult! I mean, which part of the whole, foggy sky are you going to point the camera at? EDF: One of the humans, Monte, says that the pelicans like to make eye contact, that they seem as curious as dogs. Are they as intelligent as, say, parrots? JI: They’re very intelligent. they’ve been around for 30 million years. They’re resilient and adaptable, although they’ve run into a lot of changes in the last one hundred years. 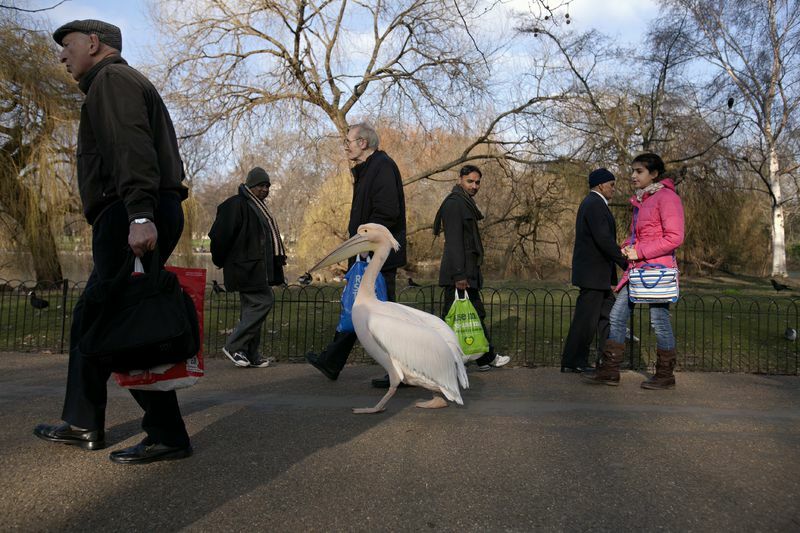 Life has become a lot harder for pelicans in the 21st century. EDF: How was DDT a problem for pelicans back in the 1960s? JI: When Montrose was dumping DDT into the ocean, the small fish ate it and then the pelicans ate the small fish, which made their egg shells so thin that they cracked when the pelicans tried to keep them warm. 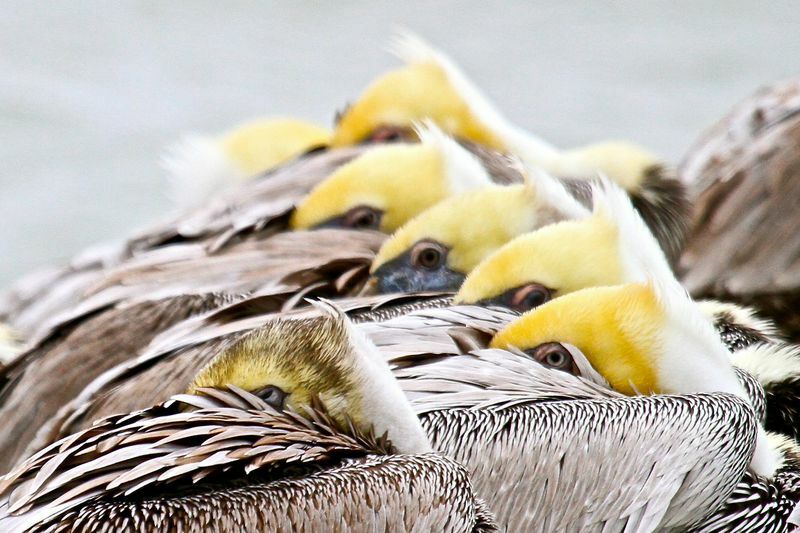 We almost lost our last colony of breeding California brown pelicans in the United States. After Montrose stopped dumping, the pelicans came back—more quickly than the bald eagles did. Brown pelicans were taken off the endangered species list in 2009, but since then they’ve run into a lot of new problems. They’ve had a lot of breeding difficulties during the five years that I’ve been making this film. EDF: In California? Or in Mexico? JI: Both. This was not a good breeding year. In many cases it’s because they were starving. Whether it was on account of something natural, climate change, or overfishing, it’s cause for concern. Hopefully they’ll get better monitoring from the Fish and Wildlife service from here on out. There hasn’t been any concerted effort to monitor them since they were taken off the endangered species list. EDF: You include the famous limerick, “A wonderful bird is the pelican…” Who wrote that? And who recites it? He sounds like a real Irishman. JI: That was Myles Dungan, a radio broadcaster in Dublin. Mark and I met him at a screening of the wild parrot movie and we became friends. His voice shows up one more time in the film, but where is a secret. People always think the limerick was written by Ogden Nash, but it was actually written by Dixon Lanier Merritt more than 100 years ago. EDF: While the film does deal with the problems that pelicans face, it isn’t a doom-and-gloom documentary. it seems optimistic about the future of the pelican. Are you optimistic? JI: Yes. They’ve been around a lot longer than we have. They’ll survive us, I think. It’s really my valentine to pelicans. Pelican Dreams is playing in the Bay Area at the Balboa Theatre in San Francisco, the Rialto Elmwood in Berkeley, and the Smith Rafael Film Center in San Rafael. It opens Friday, October 31 at the Camera Cinema 3 in San Jose, Rialto Cinemas in Sebastopol, and Sebastiani Theatre in Sonoma, with wider release across the US this fall. 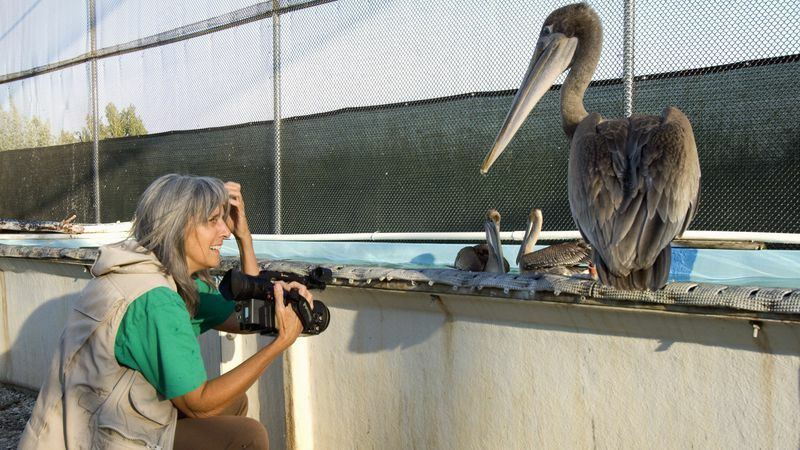 Judy Irving will appear for Q&A at Camera Cinema 3 (October 31, 6:30 pm); Rialto Cinemas in Sebastopol (November 2, 3 pm; with Mary Ellen Rayner of the Sonoma Bird Rescue Center); and the Sebastiani Theatre (November 1, 7pm). 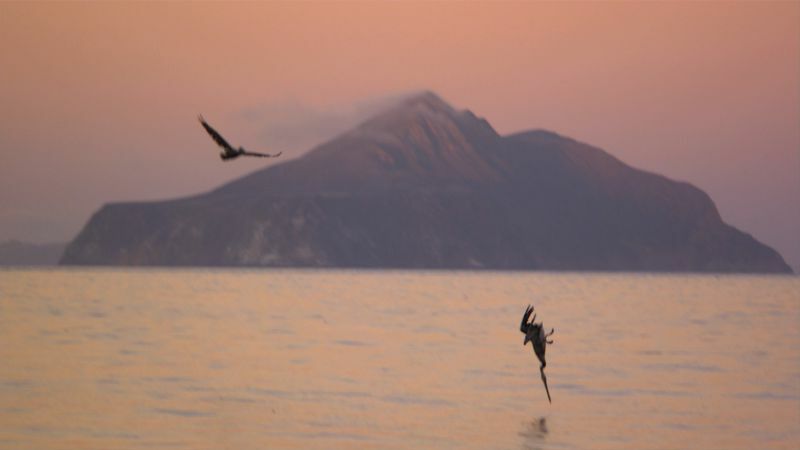 Morro, pelican star of Pelican Dreams, will appear with caretakers Dani and Bill Nicholson and Judy Irving at the Palm Theater in San Luis Obispo (November 15). Go to the film’s website for more screening and Q&A appearance info. Judy Irving is a Sundance-and-Emmy-Award-winning filmmaker whose credits include The Wild Parrots of Telegraph Hill, a feature documentary about the relationship between a homeless street musician and a flock of wild parrots in San Francisco, and Dark Circle, a feature documentary about the nuclear industry. 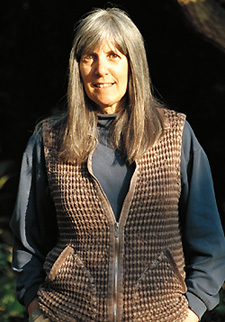 Her documentary film career has taken her to Alaska, Japan, Russia, Nepal, and Zimbabwe, with peace and the environment as her main areas of interest. Wild Parrots was a Top Ten Film of the Year (National Film Critics’ Poll) and the highest-rated program on the 2007 national PBS series Independent Lens. 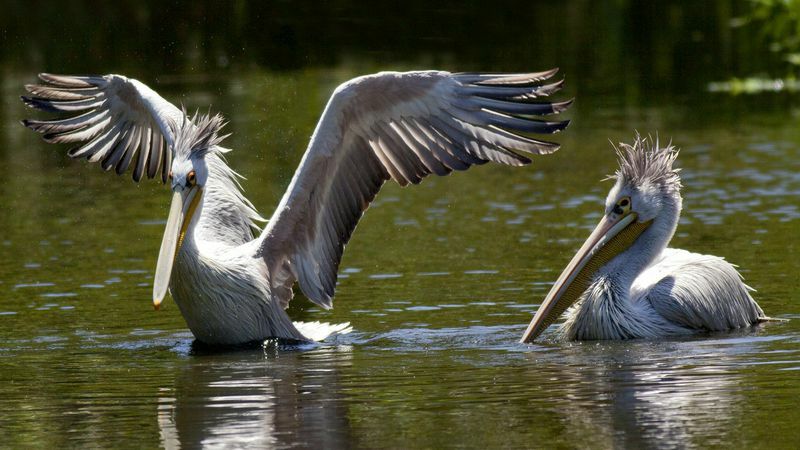 This entry was posted in Films and tagged Bay Area wildlife, birds, documentary, Films, Judy Irving, Pelican. Bookmark the permalink.